Drew Goodman and his wife, Myra, didn't know they would contribute to a culinary revolution when they cofounded Earthbound Farm in 1984, planning to grow organic raspberries and greens for local restaurants. The Goodmans have come a long way from their roots on a two-acre parcel in Carmel Valley. "We were going to spend a year living on a farm and then get on with our lives and careers," recalls Drew, who earned a bachelor's degree in environmental studies from UC Santa Cruz in 1983. But customers quickly developed a taste for the Goodmans' mixed baby greens, and they loved the convenience of buying prewashed salads in resealable bags, an innovation the couple came up with when a sale fell through and they were faced with a field of lettuce that was going to go bad. Demand for the salad mix outpaced supply, prompting the Goodmans to team up with large-scale, Salinas Valley-based farmers whose winter operations in Arizona and Mexico enabled Earthbound Farm to satisfy consumer demand. Today, Earthbound Farm produce is grown on more than 15,000 certified organic acres. Higher volumes dictated the development of new ways to harvest, clean, bag, and ship delicate baby greens, putting Earthbound Farm at the forefront of organic farming, processing, and packaging. "It wasn't until a few years ago that we realized it wasn't going to slow down. It's like we've been sprinting nonstop to keep up with it," says Drew. "People say 'That's a good problem to have,' and I say, 'Easy for you to say!' It's not like we planned to have a business on this scale. It just evolved, and we grew along with it." Drew and Myra Goodman grew up a block apart in Manhattan and attended the same high school, but they reconnected at a Grateful Dead concert during their college years in California. Myra was at UC Berkeley, and Drew was enrolled at UCSC, where he appreciated the freedom to try new things. "You can't be afraid to fail, and that was the nice thing about UCSC," recalls Drew. "You learn by experimenting and succeeding and failing. Education is about being taught how to think, rather than how to do something." It's a lesson the couple hope to convey to their son and daughter. The Goodmans share a strong commitment to growing organically, avoiding chemical pesticides and using compost to enrich the soil. Drew, who worked in the field every day until the mid-1990s, now devotes most of his energy to running the company's business affairs, splitting time between the company's headquarters in San Juan Bautista and offices in Carmel. But he still enjoys spending time on a tractor at home, in the two-acre backyard garden where they first began growing produce. The success of Earthbound Farm has opened the door to organic food at big-name retailers like Costco, Wal-Mart, Safeway, and Albertsons. "Costco was an interesting progression, actually," says Drew. The big-box retailer initially shied away from the organic label, afraid it would "send the wrong message." But times have changed. Now customers embrace organic products, which Earthbound Farm is able to offer at a price similar to conventionally grown greens. "Now, if they substitute conventional, they get a lot of comments from customers and requests for organic," says Drew. Earthbound Farm now markets more than 100 organic products, from salads to a cornucopia of fruits and vegetables, including carrots, potatoes, apples, tomatoes, and grapes. The Goodmans hope to build on their relationships with farmers and major retailers to expand their distribution and make organic food as available as conventional fruits and vegetables, at an affordable price. If a high-quality organic option is available and the price is competitive, many shoppers will choose organic, says Drew. "We really feel like people should have the option available to them, regardless of location and income level," says Drew. "And that means getting organic into mainstream stores where people shop. Most people are not going to go to another store to buy organic produce." Growing food organically costs more, but the Goodmans are able to offer a competitively priced product by pursuing economies of scale in farming, harvesting, transportation, and distribution. They're constantly expanding their farmland, facilities, and partnerships with farmers, enabling them to broaden the range of products they offer. "We've learned enough about farming to know we're not set up to be the best carrot grower or the best citrus grower," says Drew. "But we distribute products under our brand to all these retailers who do business with us because we have the volume, variety, and quality they need. What's important for the retail industry is being able to rely on their suppliers year-round." 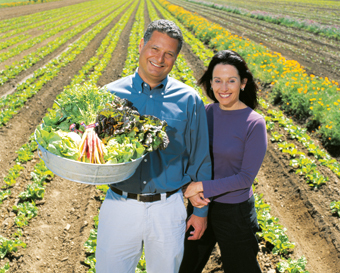 In addition to giving people more choices when they buy their food, the Goodmans take pride in seeing conventional farmers adopt organic techniques simply because they work so well. "Our success shows that organic farming is viable on a large scale," says Drew. "We've proven that it's possible to produce top-quality produce without relying on chemical pesticides. We're helping to protect the planet for future generations. That's a very satisfying accomplishment."